Whether you need a storage cabinet for your office supplies, or a warehouse full of heavy-duty shelving, office tables, office carts and furniture, you can count on Tennsco to provide you the products you need for your business or home office. Since 1962, Tennsco Corp. has offered a wide variety of filing and storage systems, steel office furniture, industrial and institutional shelving, lockers, carts and shop equipment. The company’s broad product line is both durable and functional. Headquartered in Dickson, Tennessee, Tennsco has more than 1.4 million square feet of manufacturing space in six plants. Tennsco also provides custom products to meet the needs of any customer. 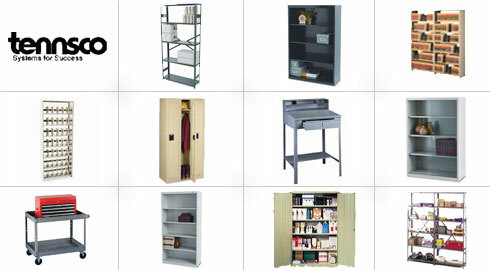 Tennsco manufactures the widest array of products designed for every storage and organizational need of businesses and homes, and ReStockIt.com carries hundreds of Tennsco products, including bookcases, office desks, office file cabinets, office shelving, office storage and office tables. Tennsco has one of the broadest offerings of steel storage and wardrobe cabinets ranging in size from desk height to our 48"w x 78"h cabinets. All cabinets have easily adjustable shelves which do not require easily misplaced clips. At ReStockit.com, our top sellers include Executive Steel 4 Shelf Bookcase with Glass Doors, 66" Gray Metal Bookcases and Add a Stack Shelving Systems. Browse for these and other Tennsco products and save up to 40% off retail prices!